We are back at it again for another season! 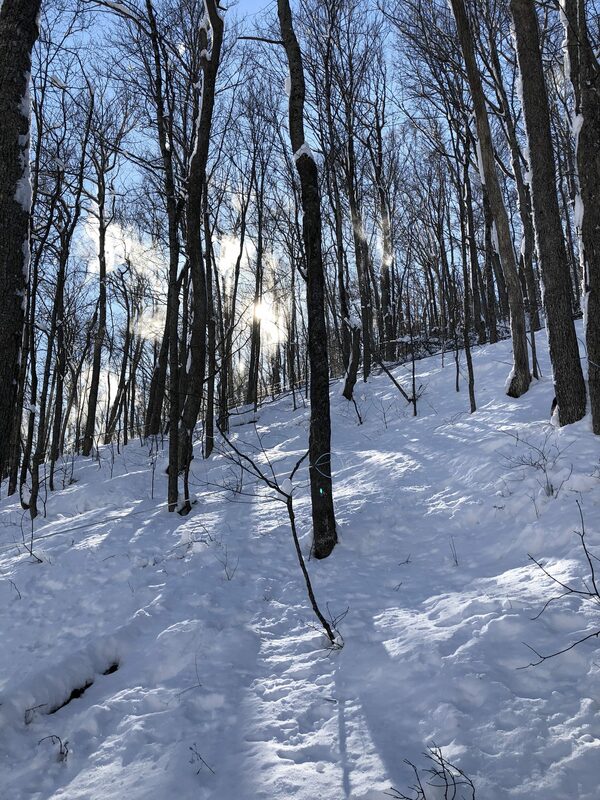 We have been working in the woods every chance we get prepping for the upcoming sugaring season. Currently, we are out replacing the drop lines; they connect the individual trees into the larger tubing network. It has been a struggle getting around let me tell you…First we had some snow and rain to follow creating a wonderful skating rink for us to climb up the mountain on. The first day we didn’t get too much accomplished, as we were sliding from tree to tree. Rich said it took him about an hour to get 4 trees done! We seemed to spend more time falling than actually doing work. 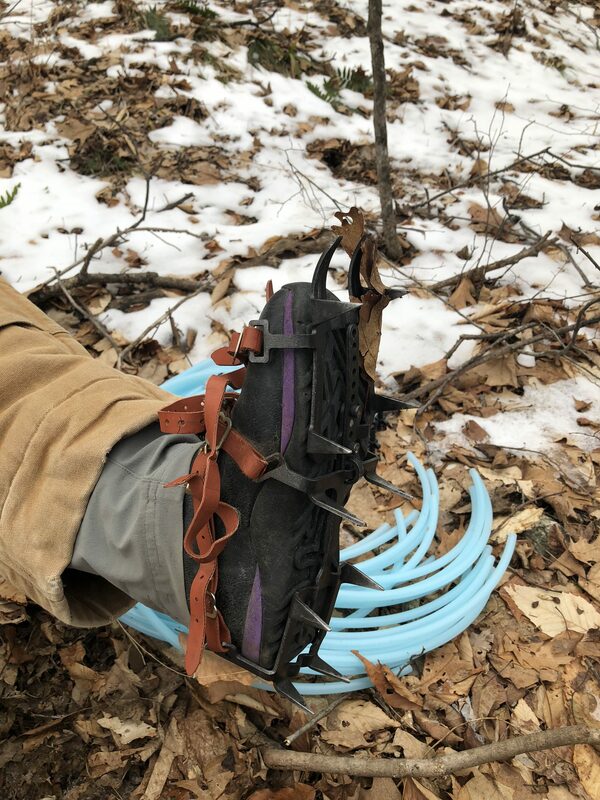 These have made getting up and down the mountain much faster, we can walk from tree to tree with ease, and maintain our sap lines. Now, Mother Nature has graced us with 14 inches of snow over night on Super Bowl Sunday. Still wearing our spikes we are plowing through the snow replacing drop lines. We only fell a few times today; there is still ice underneath the snow, but at least when we fall now it is a softer landing! 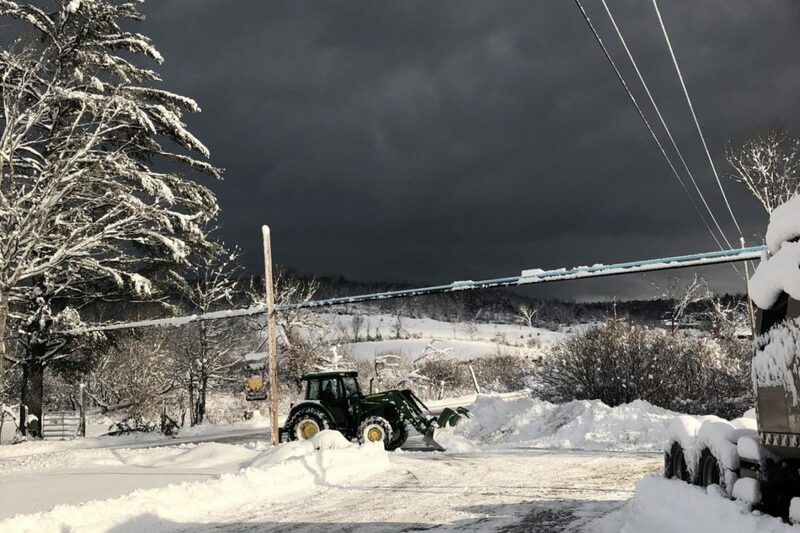 The snow is not going to stop either…We are in for round two on Wednesday this week. We may have to change our footwear to snow shoes at that point! We are on track to be tapping our trees by Valentine’s Day. This is our normal tapping time, but we are always keeping our eye on the extended forecast to see when warmer weather is going to hit us. When not working in the woods we have been busy updating our website and creating new maple products. This summer at farmers market we tried maple sweet tea. It was something fun and new for us and our customers. It was perfect to sip on while enjoying the market. We also starting playing around with the idea of creating maple granola. After many months, a dozen different recipes and taste tests we have finally landed on the right maple granola recipe. We want to thank all the taste testers from the farmers market, chili cook off, and people that stopped into the sugarhouse for a tour. Your input was very helpful and we hope you enjoy our final product All Natural Maple Granola. We are excited to share our new maple product with you! We just recently added it to our website and you can find it on the sugarhouse store shelf as well. We have been working on some other new products too…keep your eyes peeled they should reveal themselves soon!